In celebration of National Hispanic Heritage Month, Hormel Foods employee resource group Nuestra Gente hosted salsa competitions at the company’s Corporate Office (Austin, Minn.) and the Los Angeles sales office in Irvine, Calif. The observation of National Hispanic Heritage Month, which runs yearly from September 15 to October 15, started in 1968. The timing is significant because it includes the anniversary of independence for a number of Latin American countries. At the Corporate Office, 10 teams competed in the fifth annual salsa contest. 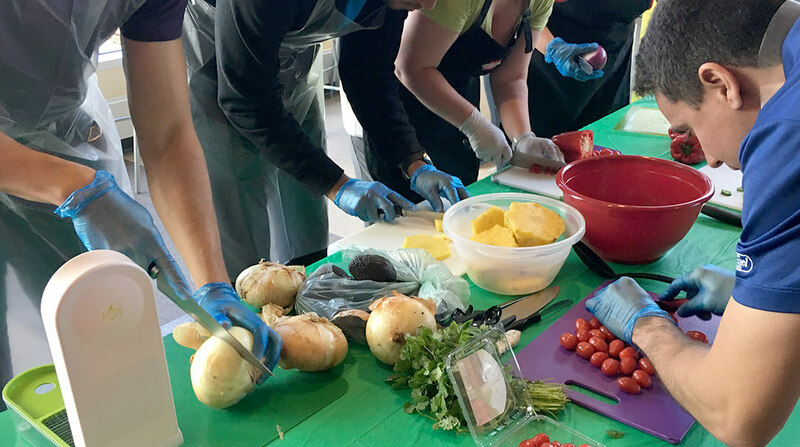 Each team was given a cutting board and six basic salsa ingredients. They were allowed to bring in any preparation tools and up to three secret ingredients. Participants had 30 minutes to prepare the best overall salsa and/or the most unique salsa and the awards were decided by popular vote. Hormel Foods Corporation Fourth Quarter Earnings Conference Call Hormel Foods invites you to participate in a conference call to discuss the company’s fourth quarter results. Hormel Foods Highlights Balanced Portfolio and Reaffirms Guidance at Barclays Global Consumer Staples Conference Hormel Foods leadership offered insights on the company’s strategies during the Barclays Global Consumer Staples Conference.